This simulation allows students to compare the motion of free falling objects with and without the influence of air resistance. Air resistance is the result of collisions of the object's leading surface with air molecules. On Earth, objects falling through the air usually encounter some sort of air resistance, though the amount is dependent upon several factors. In this model, a blue ball falls under the influence of gravity alone. A falling red ball is subject to both gravity and air resistance. Students can adjust the amount of air resistance with a slider. When the simulation is played, graphs are simultaneously plotted that show position vs. time, velocity vs. time, and acceleration vs. time for both falling balls. See Annotations for an editor-recommended, interactive tutorial that further explains free fall and air resistance. This item was created with Easy Java Simulations (EJS), a modeling tool that allows users without formal programming experience to generate computer models and simulations. To run the simulation, simply click the Java Archive file below. 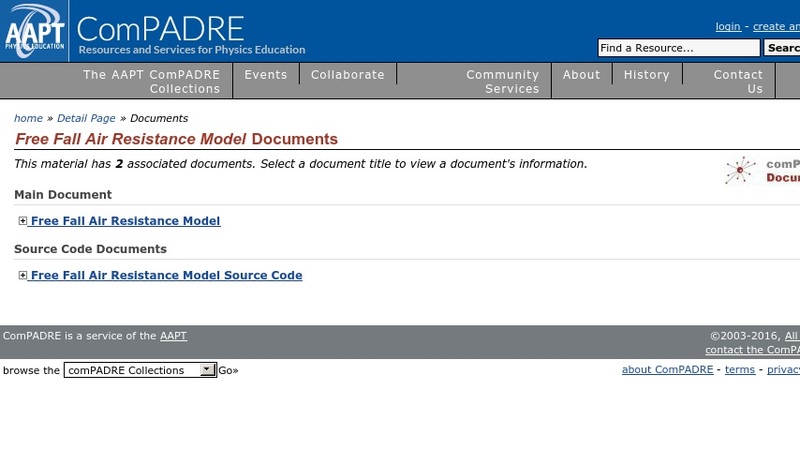 To modify or customize the model, See Related Materials for detailed instructions on installing and running the EJS Modeling and Authoring Tool.